Besides that helps relieve headaches and regulate blood pressure, works wonder for skin. 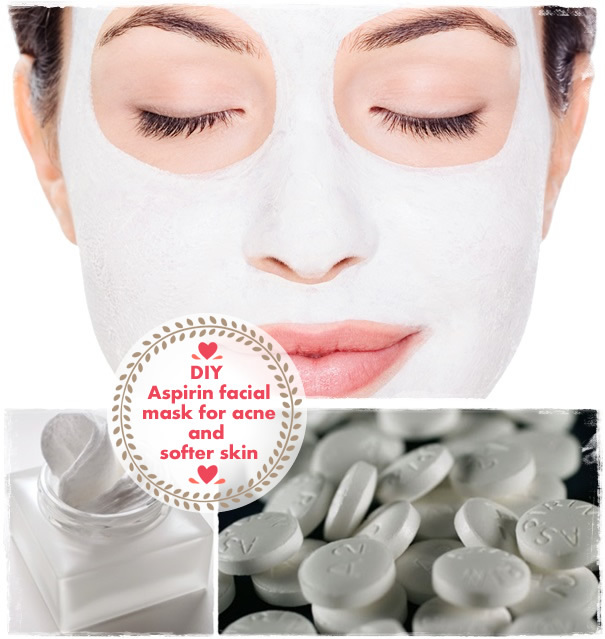 Aspirin face mask helps to heal acne, but also to clean and exfoliate the skin.This aspirin mask with lemon juice and baking soda is an extraordinary home remedy, perfect for cleansing the skin. By dissolving aspirin breaks down into salicylic acid that helps to remove pimples and acne by exfoliating dead cells proceedings. It is also has a good anti-bacterial effect and rejuvenation of skin cells. Lemon juice contains vitamin C and citric acid, which helps minimize the damage of the skin made by sun during the summer and the oxidation of the cells. Baking soda is a natural exfoliator which leaves a sensational skin. It can be used once a week for normal skin and 2-3 times per week for oily skin. Put the aspirin in a bowl and crush it with the back of a spoon. Add lemon juice and mix until the aspirin dissolves. Using cotton or a cotton ball, soak it in solution and apply it to the face, avoiding the eyes and lips area. Leave it to act for 10 minutes. Meanwhile, put the baking soda to dissolve in a cup of water after 10 minutes, wipe the face, starting from chin, cheeks and continue to forehead with your eyes closed. Finally, rinse with cold water the whole face. The process is repeated two times per week. You can also try the aspirin facial mask with honey. Face mask with aspirin and honey is very good for oily skin because it cleanses it. It is prepared by grinding five pills of aspirin mixed with a half teaspoon of honey. The resulting paste is applied on the oily skin with gentle motions, and then leave it to act for 15 minutes. Thereafter, dab the face with a wet towel and rinse with warm water. This mask is applied twice a week to avoid skin dry. Previous articleBaking Soda – Where and how to use!